With the Scottish Premiership’s bottom seven teams separated by just seven points, fans have again been calling for a bigger top flight. And Motherwell gaffer Mark McGhee – one of the 12 managers currently trying to revitalise their squads during a three-week winter fixture break – can see their point. “I think everybody would like to have more teams in the top league,” McGhee said. “But we don’t want cannon fodder. We don’t want three or four teams coming up and then getting beaten up every week. “We want the league to be as competitive as possible. “If teams come up and live up to us, Partick Thistle and Hamilton then everyone would welcome that. McGhee said that Championship teams with big fan bases like Hibernian, Dundee United and Falkirk would be an asset to the Premiership if they got into the top flight. But he stressed that the ramifications of them coming up would need to be carefully considered in terms of entry criteria and adapting the top flight fixture list. “It’s easy to say: ‘Let’s have 16 teams’,” McGhee added. “But in that case how many games do you play? 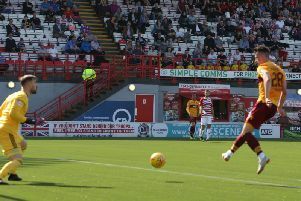 Despite McGhee’s enthusiasm for a bigger league, he stressed that those running top flight clubs – including Motherwell FC chief operating officer Alan Burrows – might have a different perspective on the issue. “There is a finite level of resources for the existing teams in the Scottish Premiership,” McGhee said. “They all need to be making a decent amount of revenue in order to sustain any sort of challenge. “We can only use money we are earning ourselves through the gates, marketing, TV and transfers. Nobody is helping us so we have to generate all the funds we spend. “If we dilute that by including 16 teams instead of 12 then that will make it difficult and further reduce the overall standard.